The Norfolk screen shown in your interesting article is that at Tunstead. For a selection of pictures (not mine), including the saints on the screen, see here. We know when the screen was made and also when it was painted. Over 35 years ago I turned up a series of late 15th century Norfolk wills containing bequests to this; it was called ‘new’ in a will of 1470, and money was left for its painting between 1474 and 1490. 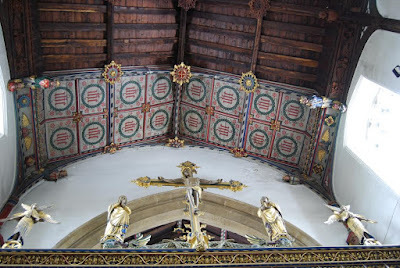 By the way, no mediaeval rood groups survive in situ in English (or Welsh or Scottish) churches. Any you see today are replacements between the late 19th century and c. 1960 (when they became vieux jeu to church architects). 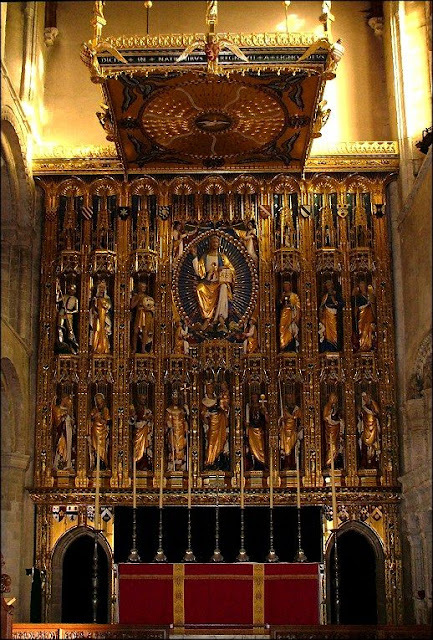 I’ve attached a jpeg of Comper’s [Sir Ninian Comper] restored rood group (c. 1930) to the mediaeval screen (substantially its original colouring and gilding) at Eye in Suffolk. 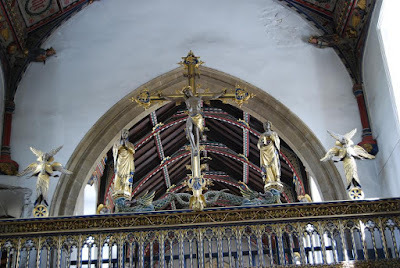 Comper also provided the canopy of honour, in the mediaeval style. 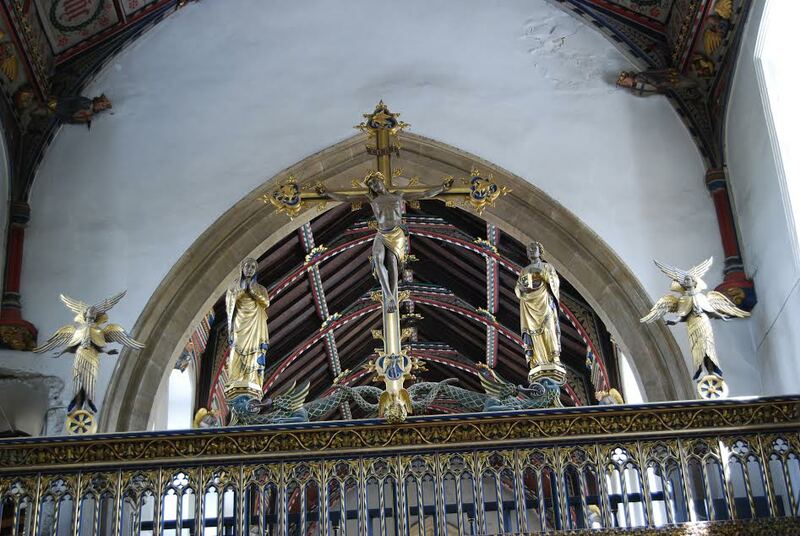 Here are two articles, written in 1987 and 2014, for archeological publications in which he describes the sources for our knowledge on the rood screens. It is interesting to me that so many were made from money left in bequests. And once again, whether its cathedrals, railway stations, rood screens, telephone boxes, or a charming English village in its familiar pastoral setting, we see that so much that is good in the world has come from the inspiration of the liturgical forms of High Anglicanism. How much more powerful it will be, with the Real Presence at its heart, when the Anglican Ordinariate develops its own cultural voice rooted in its Catholic liturgy. Some readers pointed out that the medieval screens would probably have had curtains. I’m guessing that the extremely ornately carved High Anglican screens would not have done. I don’t feel they are lacking anything for this. The ornate, almost filigree carving that you see on the screens creates a general image of a gossamer like veil before the altar which I personally find appropriate and appealing. The final photograph is of a high altar and reredos, also by Sir Ninian Comper at Wymondham Abbey in Norfolk (added by me! ).